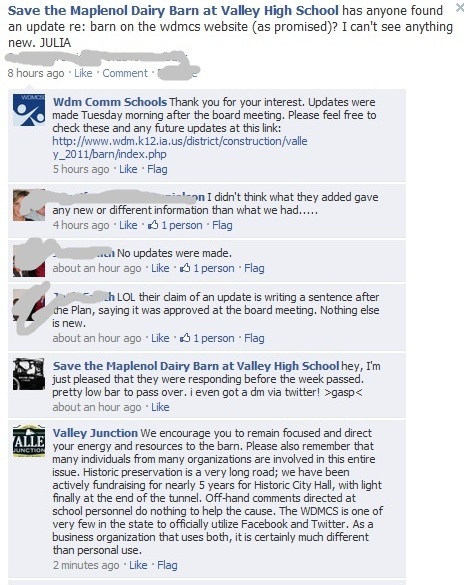 ?Here is a recent exchange, just witnessed on our Save the Barn Facebook page. Take a look. In this case, I am the author of the Save the Barn post and comment. Today is Wednesday, the district said it would update on Tuesday. In our town, many businesses have facebook pages, twitter accounts, and blogs for their customers to read. Businesses that use social media are PRAISED HEAVILY by our local print media. The Sunday paper just featured a social media manager on page 2D of its Business Section for gosh sakes. Are government entities businesses? Yes, they are. They have chain of command and products and services for their customers with money flowing in and out. Maybe government groups like school districts could get hero-level praise in print if they adopted social media. Way back when, I stated that Save the Barn’s Facebook content was “genuine, instant, suited to today’s citizens, and had compelling content.” That is how it gets its fans to interact so deeply. What business wouldn’t want that? So really, Valley Junction (VJ), focus on business only? Do you maintain co-worker relationships that are strictly business, no commenting on family photos, no inside jokes, no shared hobbies outside of work, etc.? When a business enters the social media arena, it is inviting its adoring public and supportive fans to enter a personal partnership. The public is its (unpaid) co-worker! Free instant feedback. You can certainly work and laugh and have asides at the same time. Doesn’t everyone like great customer service? Doesn’t the business look good when the product or service is good and the customer is pleased? I heard school administrators say that more involved parents equals higher achieving students. What better gauge than comments on a facebook wall or retweets? So why all the defensiveness, VJ? I am very pleased that the district responded. But the content was disappointing to Save the Barn page members. Referring to the newspaper article mentioned above, I quote the first line, “Social media begins with listening to others.” Maybe the lack of “official utilization” points to administrators not wanting to listen to others. Guess I picked the right place to live. The district is moving in the right direction as it strives for the instant communication that I mentioned above. This has to happen if it wants to regain the trust that it’s lost over the barn issue. Over 2000 Save the Barn members will be watching. The district could be a hero. This entry was posted in save the barn, social media. Bookmark the permalink.